A team of seven (7) accreditors from PAASCU (Philippine Accrediting Association of Schools, Colleges, and Universities) led by its staff chairperson Dr. Cynthia Arcadio conducted the re-survey visit of the Basic Education Program of CSCJ on March 7-8, 2016. The PAASCU Team recognized the collaborative effort and spirit put into the institutional self-survey by the administrators, faculty, and staff of the Basic Education Department as well as the support of stakeholders and the desire to grow and improve and the commitment to high quality of education. 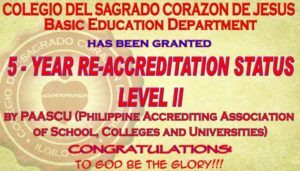 The new 5 year re-accreditation status qualifies Sagrado’s Basic Education Program to apply for the Level III accreditation by PAASCU. The school owes it to the graces from the Most Sacred Heart of Jesus and Our Lady and the love, concern and full support of our DC Sisters, parents, alumni, friends and stakeholders.